Dear Great Observatories: Don't ever stop sending these beautiful images home of our universe in all its diverse wonder. 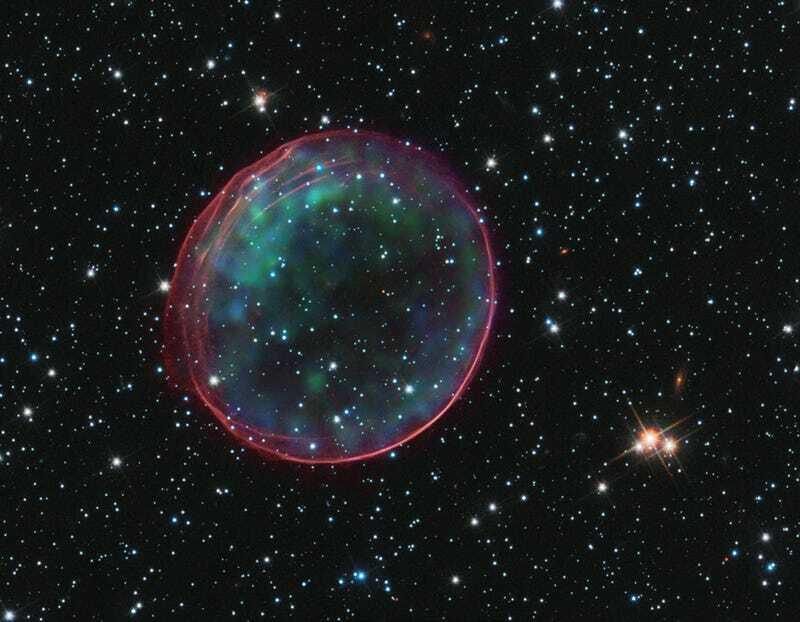 This optical/X-ray composite of supernova remnant SNR 0509-67.5 is a delicate bubble tracing a shockwave of excited gas, and too pretty for words. Supernova remnant SNR 0509-67.5 is roughly 160,000 light years away in the Large Magellanic Cloud, a satellite galaxy to our home Milky Way. The bubble is about 23 light-years wide, expanding at over 5,000 kilometers per second (11 million miles per hour). It was produced by a Type Ia supernova, the end result of a white dwarf star in a binary system hitting critical mass and brilliantly exploding. The Great Observatories are a set of NASA space telescopes each covering a different set of wavelengths. This composite blends X-ray data from the Chandra X-ray Observatory with an optical photograph from the Hubble Space Telescope. The Hubble Space Telescope sees the universe the same wavelengths we see it, in optical light. For the optical view of SNR 0509-67.5, Hubble's contribution captures the ambient star field (white) imaged with the Wide Field Camera. Using the Advanced Camera for Surveys with a filter to isolate glowing hydrogen gas, the telescope photographed the gas from the supernova shocked and excited by the expanding blast wave (pink). The brightest, most excited gas lines up with concentrations of hotter areas identified in the X-ray data. By observing the light echo, astronomers determined the star exploded about 400 years ago from our perspective (160,400 years ago if you take into account how long the light has been travelling!). While it could've been visible in the southern hemisphere at the time, we haven't found any observational notes recording the appearance of a "new star" joining the familiar skies.